Mexican food is full of fresh ingredients and flavours. I love how there are tons of possibilities for vegetarian cooking. 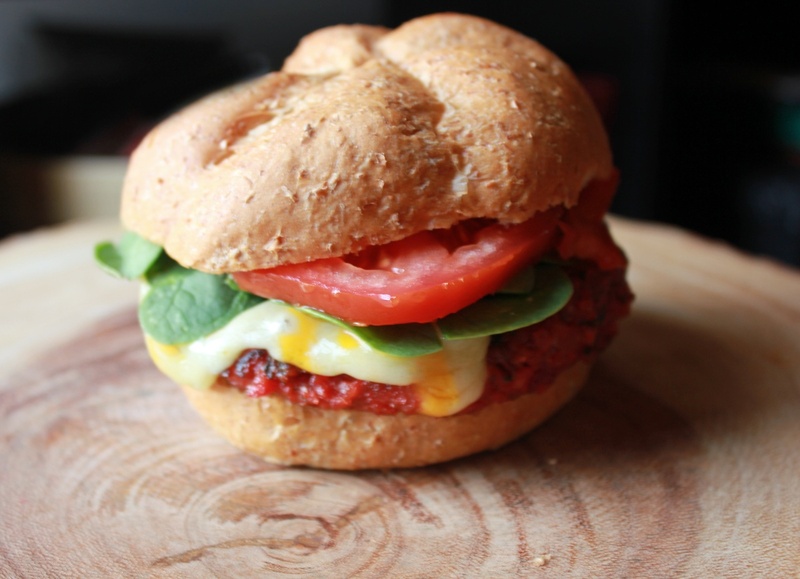 Not only is this recipe delicious, it is also high in protein and fibre. I first tried out a similar recipe in one of my favourite cookbooks, Quinoa 365 by Patricia Green and Carolyn Hemming. This is my version. 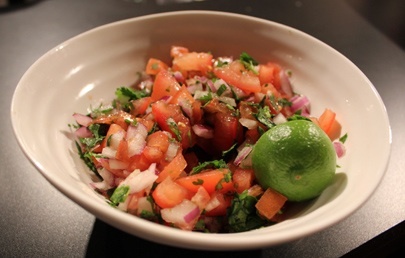 Start by mixing all of the salsa ingredients together in a bowl. 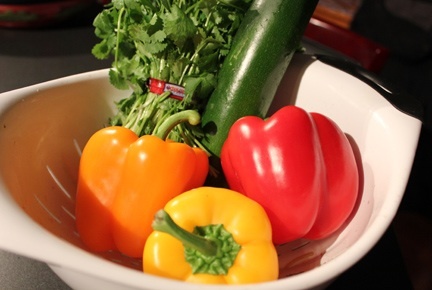 Set aside; allow flavours to mix while preparing the other ingredients. Preheat the oven to 350 F and grease a 9 x 13 casserole dish. In a medium sized saucepan, bring 2 cups of water and 1 cup of quinoa to a boil. Cover and turn heat to low. Cook for 10-12 minutes until all of the water is absorbed. Fluff with a fork. While quinoa is cooking, start chopping the veggies. 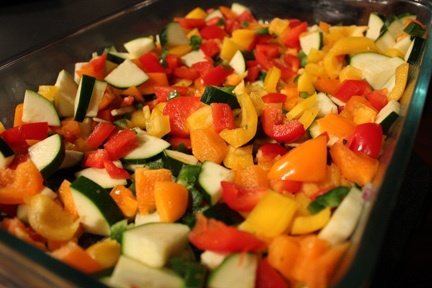 Combine all vegetables together in the bottom of the casserole dish and spread evenly. 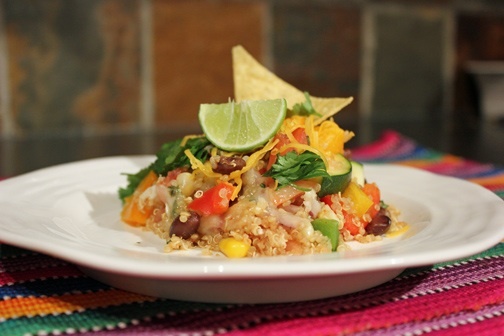 Once quinoa is cooked, add the black beans, corn and spices to the saucepan. Stir until mixed thoroughly. 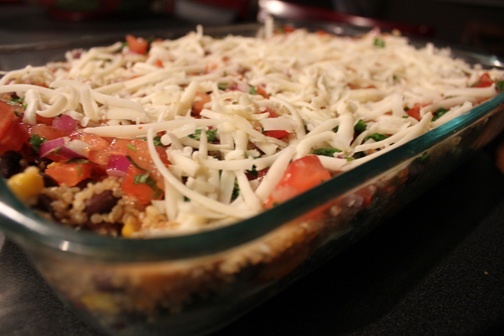 Place the quinoa mixture evenly over the vegetables in the casserole dish. Spread fresh salsa over top of quinoa mixture. Top with grated cheese. Bake for 25- 30 minutes until cheese is melted. Serve immediately and top with your choices of cilantro, salsa, tortilla chips, freshly squeezed lime juice or sour cream.